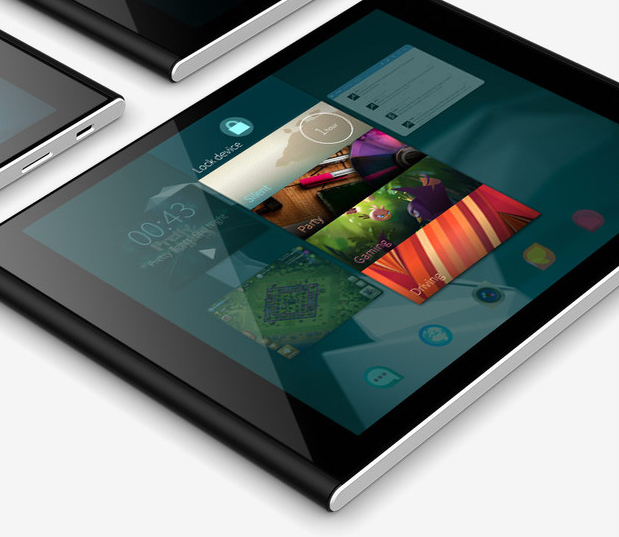 Jolla Ltd., developer of Sailfish OS, decided to try with an interesting revenue model. 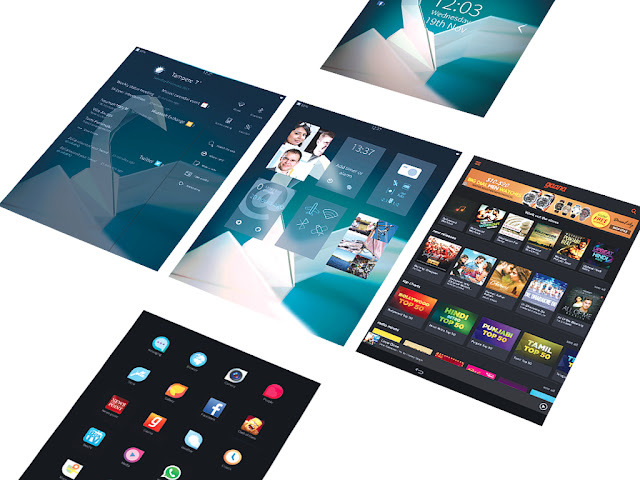 Instead of cashing on licenses of their operating system, they are offering Sailfish OS, a gesture based mobile operating system, to smartphone manufacturers and to other mobile device manufactures for free, gathering their own income as small portions directly from the end customers using the devices. The feature enabling this revenue model on Sailfish OS devices is called "PartnerSpace"
It's developed to enable offering of local services to end customers. It's placed in a key location of the user interface of Sailfish OS. It's supposed to bring the main income for Jolla. It's risky, but it might just work. 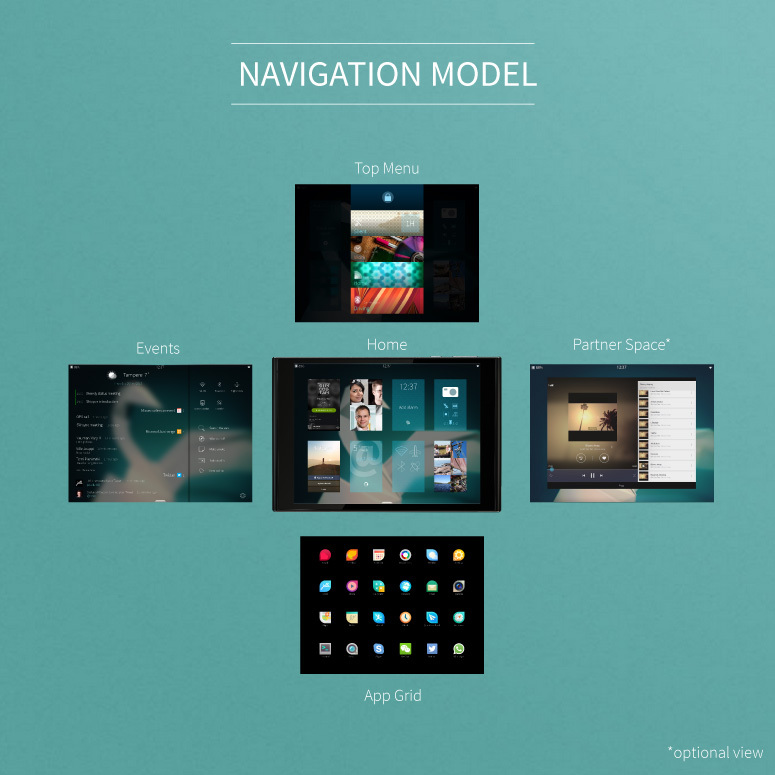 Compared to earlier versions of Sailfish OS, we can see a radical change in the user interface above. 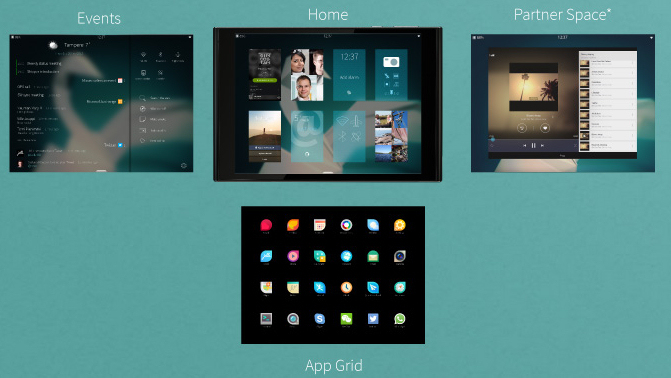 Image shows the five main screens of the upcoming user interface of Sailfish OS 2. These screens are easily accessible via simple one finger gestures, and between the multitasking Home view (center) and Events view (left) we can see the new PartnerSpace view (right), in this example filled with content of gaana.com. User can scroll between these three views from left to right or from right to left, so not seeing the PartnerSpace at some point is practically impossible. Earlier on this space users were able to quickly change the ambience (background, text colors and sounds) of their devices. The ambience switching feature is now moved into a top pulley menu, showing a scrollable list of your favorite ambiences, so it's just as easy as before. Having a dedicated zone for paid services seems like an idea worth testing. We've used to see advertisement all around the user interface on Android devices, mostly in apps, notifications popping up, even as messages. The amount of ads shown to users seems to be growing on Android. On Sailfish OS, it seems like all the advertised content is planned to be visible on this PartnerSpace, setup in a location to where the end user finds him- or herself easily, in purpose or even accidentally. Depending on the agreement it's possible that the partner on Sailfish OS devices has also an access to the notification system, integrating notifications of any new offers, guiding users to visit the PartnerSpace "for more". The goal in both Android and Sailfish OS is a tap. Tap to create an order for any paid content or products. Is this good or bad - depends on the content, right? What if someone don't want to see a PartnerSpace? PartnerSpace adds to the true cost of the device - when the price of Sailfish OS is not added to the retail price directly, the device is cheaper to buy and the OS on it is "paid afterwards", or at least this is what Jolla wishes that will happen. However, Jolla has promised to introduce the scale of open sourcing their operating system soon. We can be certain that there will be unofficial patches offering users an option to get rid of the whole PartnerSpace, or change it into some other content the hackers sees as better. The benefit - possible win-win-win situation! As in every purchase, it's the content and its price tag that matters in the end. 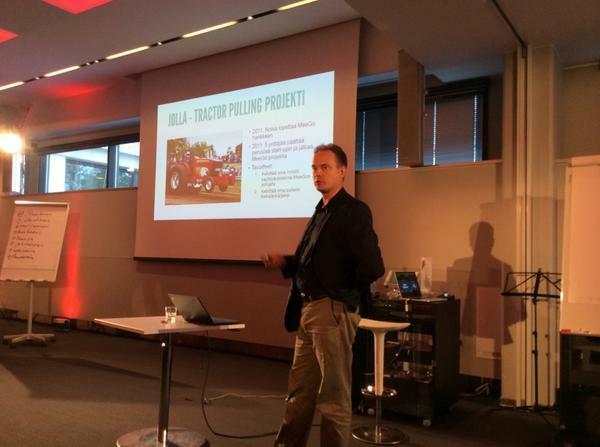 Jolla offers an easy access to mobile commerce, PartnerSpace owners will be in a key position with their content. If the content is worth a purchase, the end customers will sure find it a nice way for online shopping. If the devices are sold cheap enough, there will be a lot of ordinary customers using it. If the system works as planned, there are no losers - it's a winning deal for everybody: The end customer, the PartnerSpace owner, the device manufacturer and the Sailfish OS developer Jolla Ltd. Lot of "if" included - risky business? This business model is to be tested soon via agreement between Jolla, Intex, TimesInternet and Snapdeal - members of freshly announced Sailfish India. End customers are looking for outstanding offers and great content, not ads. The offers are especially important in the beginning, and there should be some great ones exclusive on PartnerSpace. These might get the end customers to talk to new potential customers, sharing all around how they got real value after selecting that device. A happy end customer is the best advertisement for the content provider. Retailer is a very interesting party in an agreement like this, as they decide the final price tag of the device. The traditional way is to start from high, satisfy the first group of customers, the enthusiasts, and then drop the price to get the masses interested as well. Is this a way to go in this business model too? Each partner in this deal is dependent on the final price tag starting from the beginning, and selling to masses is essential. We already know there will be one smartphone by Intex in below INR 10 000 category in India, expected to be launched on November. Let's see the specs on that. Device may be expensive if its still worth it, but is that a price tag for masses? How about below INR 6000, could we see any decent hardware for that price too? The revenue grows only via amount of devices in use. On Jolla's behalf, a great performing operating system with viable app ecosystem is what's expected. However, the startup company resources are limited, while all the revenue is in the possible future in this model. Sailfish OS app developers are probably more than surprised that Jolla offers revenue first to Sailfish India partners before their existing app developers, the most important current partners for Jolla. Well, at least this model was announced first, while the latest info on paid apps support dates to April 2015, sharing "we are actively working on something but we don't have anything to announce at this point"
However, the operating system itself has been evaluated high by Jolla phone users. So, will there be another PartnerSpace for paid apps? Let it be that or something else, but I wouldn't place bets on the Android Support on Sailfish OS while following how the app developers there are lurked into using Play services not supported by Jolla. PartnerSpace is not a value. In its best it's a great value adding service to the end customer, but not a reason to buy a device. There are high expectations on the Sailfish OS and its native apps to be fulfilled, and there are limited resources in the development. There are potential risks, for first the native app developers changing their OS to one offering revenue, for second any greedy partners, for third the reactions from the end customers hating ads in general. For them it depends on how the PartnerSpace works, will the ads stay in their reserved zone or spread around the system, and the most important, what is offered there. In my honest opinion, Jolla's boat is now moving on a rocky waters, but I can see a huge golden harbor right in front of them. Taking careful steps with this PartnerSpace, focusing on right things like the native apps, and communicating with the Sailor's honest attitude (especially on their Open Source goals) might bring Jolla even to their ultimate goal - being the 3rd OS in the world. Will they sail there? What should they focus on in your opinion? Will the revenue be there before running out of cash? This boat is in a turning point! I would be interested to see how content for the partner space is decided upon. This makes me somewhat nervous for privacy. We will have to wait and see how this is implemented. Any word on if this will be on all Jolla devices or will pure Jolla devices, such as the crowd sourced tablet, have this as well? So it's basically preinstalled crapware. I'm not too optimistic about this partner space thing. I think Jolla should target selling high quality devices with a high profit margin, instead of going down the advertising road. Everyone hates adds and it wouldn't surprise me if someone makes a patch to remove this thing.